It has been the most amazing month for The Vintage Good Life. I just wanted to share my little collage with you that I've posted over on IG. It contains some of the lovely things that have happened in April. Mr C and I went for a long drive in the country at the start of the month (love doing this, it's what my nan and grandad used to do on a nice Sunday). We literally stumbled across a fabulous Tudor cottage falling in to disrepair, we've since contacted the owner and are trying our hardest to buy it! I do believe in fate! And if we are meant to be its next custodians then it will happen, if not... Well it simply isn't our time yet. My online store was also re-branded and I launched my very first fabric collection which I'm thrilled with! I'm currently working on a summer watercolour cushion collection. 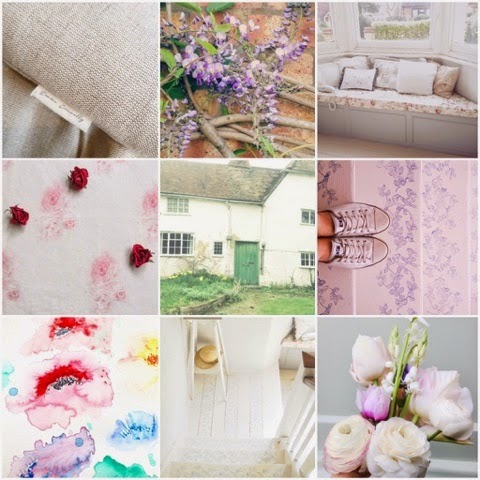 I so enjoyed guest blogging for Laura Ashley this month, I now have famous stairs! Lol and my window boxes that I did for them are looking literally good enough to eat!